For the logging connoisseurs of Lewis County, nothing cools down a hot summer day like taking a tumble into the river! Aside from a five-year hiatus during World War II, the Morton Logger’s Jubilee has been delighting crowds since 1937, proving there is much, much more to logging than plaid flannel and chainsaws. The “Granddaddy of Logging Shows,” held in Morton, Washington, a half-hour’s drive from our Ashford cabins, draws competitors both locally and internationally. 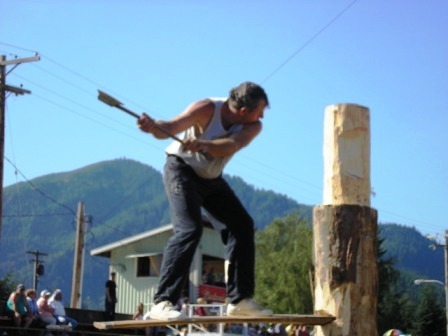 From a parade down Main Street to lively logrolling competitions, from tree climbing races to lawnmower races, the Logger’s Jubilee offers a number of ways to showcase logging skills in a weekend of old-fashioned entertainment. 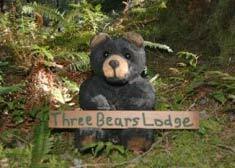 Click Play to see what goes on at the Morton Logger’s Jubilee! 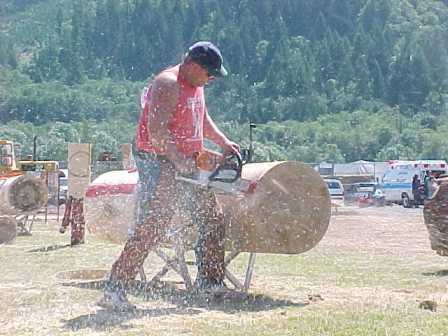 Morton’s 68-year tradition began as a logging show in 1937. It grew from there, advertised by local string bands around Lewis County and attracting more festival goers year by year. Before climbing poles were raised, men climbed the highest trees by the river, and in 1946 the competitions began to include power saws as well as hand saws. Bleachers were constructed, a Queen-crowning competition was instituted in 1955 to raise awareness and excitement for the festival, and special floats were built to be featured in the parade. Though time and technology have marched on, the Logger’s Jubilee has striven to maintain an air of authenticity: many of the competitions make use of now-outdated skills and tools, keeping history alive and accessible to generations unfamiliar with traditional logging. Morton’s 68th Logger’s Jubilee kicks off on Thursday, August 12 with the crowning of a festival Queen. Throughout the weekend you can expect delicious festival foods and a Flea Market, which is always a temptation to the treasure hunter in all of us. On Friday in the late afternoon, the lawnmower races take place. For thirty years now, contestants have built and customized a racing lawnmower and raced one another in time trials. On Saturday, there is an early breakfast, a 10k Jubilee Run (and an alternate 2 mile fun run for the kids), bed races down Main Street, and both a Children’s Parade and a Grand Parade. The Logging Show is held at 2pm, and afterwards you can attend a rendition of Grease at the local theater, and enjoy music and dancing on Main Street in the evening. Sunday is a little quieter, with a Logger’s Breakfast, a Logging Show at noon, raffles and awards afterward, and another showing of Grease. 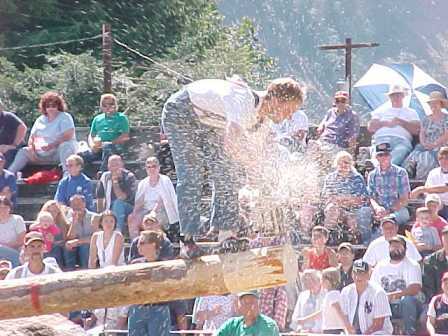 The main attraction at the Logger’s Jubilee is, of course, the Logging Show. 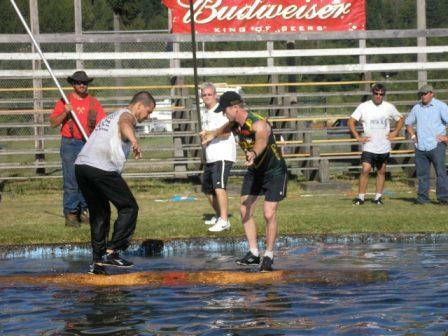 Logrolling—also known as “birling”—is one of the first images that comes to mind: two lumberjacks teetering on a log, rolling in the river and trying to keep their balance. There are various chainsawing competitions, and the bed races—where four girls haul a bed frame carrying one boy down Main Street—is yet another fun event to root for. The lawnmower races have remained intact for 30 years, offering a chance to win first prize to anyone who can build and ride a basic lawnmower (without the blades, that is!). Tree climbing, where loggers race to the top of a branchless tree pole as fast as they can and then repel to the ground, is sure to captivate, and draws competitors from all around the country. There’s nothing like a good old-fashioned summer festival, and the Morton Logger’s Jubilee is surely one of the best in Washington!